You sent me a love note some days ago. I did recognize it for what it was, though it has taken me a while to fully appreciate this, yet another of your endless reminders; the letters you keep sending me as you cheer me on in my birthing adventures. I know that you, sweet Life, have a long list of folks in your “inner circle;” people you keep in touch with. So just in case: I’m referring to the email that came n response to my last newsletter, in which I addressed my subscribers the way I always do, encouraging them to claim their fertile selves no matter what. Thank you, my revered Teacher, for sticking with me; for bringing me to a place where I understand that she, Your messenger speaks from a place of deep disappointment. Thank you for giving me a chance to send this note to You and Your messenger letting her know how much thought and caring goes into pretty much every word I send off into the ether. Thank you for giving me a chance to tell her that I hope she has all she needs to move safely through rage and hurt into knowing beyond any doubt how wisely, unimaginably fertile she truly is. Thank you, dear Life, for all your messengers, especially the ones I may not instantly realize, have been dispatched by You. To all the fertilehearted mamas and papas out there, wishing you a happy Giving Thanks Day and an open heart to receive with patience and love each of the messengers around your holiday table and beyond. Thank you Julia, for continuously reminding us how amazing we are – as wonderful miraculous human beings when the world often wants to put people down and label them. HarmoniousLife that is great to be open to reciving clues and gutsymama, I love the meditation Purple Parrot, it’s great to at least recognize the orphans and RaeSF thank you for sharing about the women’s group. Sullie612, wonderful for healing from hurtful words and Bel, I’m glad things seem happier for you. Nasreen, yay for being out of the gerbel’s wheel. I have been doing some of the guided meditation body truth and Circle of Protection Fertile Heart imagery Imagery I. Right now I’m just doing body truth and imagery in the morning. I’m adjusting to working full time. I am training for a job with a friend of mine. I don’t know if I will get the job, but in the meantime I am learning. So now I’m working out schedules to try to be as kind to myself as possible. Thank you Julia for continuing to remind us that we are all fertile whether or not the child or anything else that we long for is present in physical reality at this moment. While media and most of the medical community are all out to make us feel the exact opposite most of the times. Which makes the Fertile Heart practice and the community so unique and special. This work may not be for everyone and it’s not at all easy. It is difficult to look inwardly and take actions from a place of authority on oneself. In this month I feel grateful as I celebrate one year since I first attended my workshop at Woodstock. I feel like I am in a calmer place and there are times when I have started to believe that one way or the other I will have a child. I continue to work on keeping myself open to receiving clues, love and support which doesn’t come easily to me. Before I started this practice I used to think I am a good communicator. After I have started this journey with FH I see one of my biggest challenges is to ask for support or help. This I would not have known perhaps for a lifetime if it wasn’t for this practice. I see myself continuing to use the tools for a long time. Thank you, Julia for sharing your wisdom with us after your success with beating the odds to conceive a healthy child when medical community did not have any answers for you. I hope your story continues to inspire many women who have come across this practice and have benefitted from it, to spread the word and their learning. Every stranger or friend with whom I have shared this work had never heard of it before. This bothers me sometimes. But I take comfort in knowing that I am doing my part. Look forward to connecting with the circle on Monday! 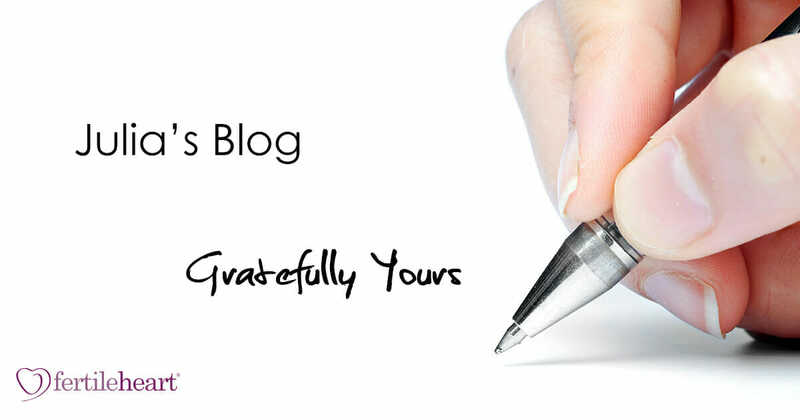 Thank you for the blog! I had a wonderful messanger recently. We had a meeting at work with just the few of us that work exclusively with breast cancer patients. Somehow recently we losed alot of patients recently and many of them quite young. We decided to hold a caregiver meeting for ourselves so we could express the grief and sadness. One physician was asked to come and he works mainly in the pain and palliative care group. He gave us some wonderful tips including imagery! He also decided to run us through a quick 10min meditation. I want to point out not just nurses where there but other physicians and I knew some were not comfortable with this but the physician did not ask permission to do the meditation; he simply told us it was giong to happen. We did the meditation and it was so wonderful. It felt wonderful to talk time for myself AT WORK. And here were others doing the same. I emailed that doctor today and told him how much I appreciated what he brought that day, how much I needed it and how wonderful he is bringing this in. He wrote me back and told me how much he appreciated I shared that with him and it meant alot to hear this. It just reminds me how much we want to be heard and feel like someone is listening and hearing us. It continues to be a journey for me. As always, Julia, your thoughts are perfectly timed. 8 was at a women’s group a month ago w a woman who had had a miscarriage. She had a lot of equanimity but our facilitator asked her if she wanted a baby…she hemmed and hawed about how maybe bringing a baby into the world was not a good idea bc of the environment etc. The facilitator asked her to speak from her heart and she then said “yes” I want a baby. And it brought up a lot for me around wanting a baby and the long road and feeling infertile, even though I have a beautiful 6 month old…I can still feel that yearning and the label. And I’m grateful that you reminded me that we are all fertile w child or without. Fertile Heart is a golden thread that had woven itself through every aspect of my being. In fact it may be the thread that holds me together most days. There is no aspect of my life that my practice is not a part of, absolutely none. I use it every day with every interaction, every action, every moment of breathing. It is truly a gift. Some days are harder than others and that’s when I lean into my practice even more. The larger the struggle the more I lean for I’ve learned that most times my challenges bring forth a discovery I would have never known before. Thank you Julia for calling me a fiercely fertile friend. Those words reminded me how fertile I can be in all aspects of my life. The first time I read them was the first bit of glue in healing the cracks from all the hurtful words I’ve heard over the years. Thank you Julia from the bottom of my heart. My very pissed O rose up the other day in the reverse of this situation: I was filling in a medical form (nothing to do with fertility) to help the hospital that has been so amazing to me with some research they were doing. And the question ‘Have you ever been diagnosed with infertility?’ came up. The O in me was tempted to chuck the form in the bin as I was so annoyed by the presence of that word, but the V in me wrote a note on the form saying please think about replacing this word with another word as it is just not supportive, especially for people who have had challenges conceiving, and I did complete the form and sent it in. I love how Julia has really helped me to appreciate myself as a whole being, and not to just be defined by whether or not I have conceived yet. Fertility is of course so much broader than whether we have created a child. And I recognise that I am indeed leading a fertile and creative life, and that my fertility is present daily in, for example, the meals I create, the way I move my body. That said, of course most of us are on here because we long for a child and to fulfil that particular aspect of human creativity. So while I am able to be grateful for the reminder that I am a fertile human being, I can also totally get why it might be hurtful for some people, as it could be perceived as a reminder of what is not yet here – and it is so easy to get stuck in that place (especially if you haven’t yet worked with Julia!) where fertility can be entirely defined by whether or not you have created that child. In my experience, it takes slow, patient and loving commitment to heal ourselves from those painful places. And while I’ve seen really good shifts happen in how I feel – for example, I now spend more time feeling happy and grateful for what I do have, rather than obsessed by what I don’t yet. Or, I used to get mad every time I came across a pregnant woman ( even ones just walking down the street), as it was a painful reminder of what everyone else except me seemed to have, but now I am mostly fine with it and simply wish them well. That said, sometimes something will trigger me and there will be times I feel like I’ve taken several steps backwards. And I get stuck there for a while before eventually coming back to base. And there are a few things/situations which are still really painful for me. But they have definitely decreased. Julia, this blog is beautiful. To respond so gently and compassionately is truly wonderful. The way I see it so many of us have been damaged by labels by the fertility community. We carry them around and they are so unhelpful. How wonderful to be greeted by something like Fabulously Fertile Friend or some such greeting. Our bodies respond to all comments directed toward us. I’m sure if we had someone direct a disparaging statement to us about our fertility we could literally feel it in our bodies and the same for a statement affirming our fertility. It does affect us. Sparxy, wonderful that so many things turn you on now and wannababy, welcome welcome!! MiraculousLife, it is always a pleasure to hear from you and GracLlife so wonderful for being supportive. Heather1975teaching beautiful post and wonderful examples of that love! I have been working with Palace of Truth (substituting Palace of Calm) imagery (Imagery II) and Guided Meditation Body Truth. My husband now has a full-time job so we are so grateful!. My daughter is experiencing the Life Teacher’s lessons after a special program did not work out for her. Blessings to all and have a wonderful Thanksgiving. I know how that pain and anguish that we have inside of us, when we try and try, month after month it conjures up an image of an gerbil in a cage going round and round on wheel. I remember when I was at school I hated seeing the gerbil going round and round on the wheel and wondered if the gerbil got any enjoyment out of. Till couple of years ago I going round and around hoping that some doctor or the acupuncture would fix my unexplained fertility it hasn’t to date, I needed to get off that crazy wheel and take control of my own fertility, to heal from within and nurture the longing to have a child, I love doing the Scared Choices, the playground, three step forwards and the white flower imagery and I may not yet have understood my orphans yet but I feel strengthened and encouraged by this work. Phrases like this ‘wisely Fertile friends’ depending on which day of the cycle we read it we may be resent it, however it gives encouragement and support during this lonely and long journey. I love this letter, Julia. And I feel so much empathy for the messenger. Just to add to what has already been so eloquently expressed by others – I felt just like this before Fertile Heart, and I still have my days. But I feel so much more fertile. 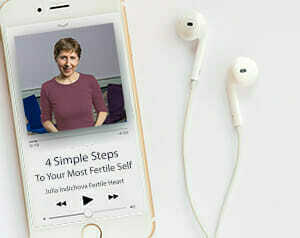 The practice, the books, the other members have opened me up to new ideas and experiences that have made me understand what fertility really is and how I want to be fertile. Julia asked about what turned us on during a call a few months ago. My mind just filled with so many things – my new roses, my dogs, my new bicycle, my nascent interest in cooking and nutrition. It just went on and on. And I realized that before Fertile Heart, there was nothing that turned me on. The practice has also helped me listen to all of the messengers, even those that I don’t want to hear. Thank you Julia and my fertile sisters. Much love this season. I just clicked on this blog tru FB and can really relate to the person who was pissed about being called fertile. But I think I get it and I honestly wish I could not be so pissed all the time. What is the FH practice? How do I get involved here? Welcome to fertile heart community !! While I fully understand how some words or statements which are intended to be good can in turn be hurtful, I encourage you to please check the video out and the testimonials with an open mind. What fueled me to work with Julia and embrace fertileheart tools is my desperation to have a baby coupled with failed IVFs and the so called “authority” (doctors – on whom I placed my full faith) dictating what is and what is not possible for me. This was the state when I searched and found fertileheart and would like to let you know that ONLY because of intense practice, today I am blessed with a healthy baby. Baby dust to you all and good luck in your journey ! There are so so many great resources on the website-the books and CDs will help you strengthen your spirit. I smiled when I read your post because I was in the angry, pissed off because I can’t have a baby and that’s what I want and I want it now place. Julia is an incredible guide, inviting you gently to move deeper into yourself. What I loved about this work is that the anger isn’t pushed aside-you can safely explore it. It’s a challenging journey, but there are some amazing rewards. Dear friend, whoever you are, I hope you read this. Sending you a virtual hug. A warm, tight, long hug. I think we have all been there, I know I have. When we want something so badly and it’s taking long to show up, so we don’t want anyone reminding us about it. Even if that person is really only trying to help, we can’t see it. We hear their words the way we want to, not how they were meant to be understood. And somewhere deep inside ourselves, we know it. But we are just pissed :( And are reacting unconsciously. I too like Heather feel reassured when I see the salutation by Julia in her mailers. I may read the mail later, if I am busy. But I still open it immediately to see the salutation and get reminded from Julia that yes, I am unquestionably fertile. But she’s Julia, I have chosen her as my mentor and guide on the journey to parenthood. I trust her. However there are so many others too who care, but I have pushed them away from me, from time to time. Because I took their questions to be as rude reminders. Not everyone who talks about it is being mean. Most people are just trying to help and think that may be I would want to talk about things and that would make me feel better. Or they have some words of compassion to offer. Being open about our life and our issues takes courage. Especially about this topic. And the fact is that I am still trying to find that courage to absolutely comfortable and open about my life. The Fertile Heart OVUM practice has helped a lot, along with my other teachers and guides. Thank you Julia. Dearest Julia, when I was a teenager and my father decided to leave the family, I felt sorrow, frustration, rage and an inability to articulate my emotions, so I would lash out at the person who was safe and I knew would still love me no matter what I said or did. My mother. My beautiful, amazing, generous, open minded, and loving mother. She would calmly explain that she understood my anger and resentment but that it still hurt her. Much like a wounded animal I would swipe my claws and the one person trying to tend to me, my mom. That was the first thought I had when I read your blog. Someone is hurting terribly and is taking out that fear and sorrow on someone trying to tend to them. I am trying to understand where they are coming from, as I always felt the reverse when I saw that opening line. It gave me hope and reassurance that I was being helped by someone who saw ME… not the numbers, the stats, the diagnosis. Years ago I was a on a phone circle with you and you said ( paraphrasing here) ” that you had enough faith for both of us”. I carry that thought with me all the time. You also said ( paraphrasing again…very badly here) that when you worked with a group of women in a workshop you saw an image of babies on their journey to those women. This too gives me the feeling that I am supported. Fertile Heart and you are my safe space. I place to explore what scares me, what enlightens me and what gives me strength. I am so very grateful and thankful for that. FH is a love letter, an honest, raw, and never ending love letter.